1. 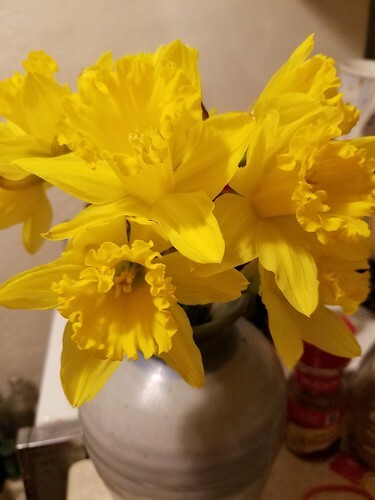 Trader Joe’s sells bouquets of ten tightly closed daffodils from a dry bucket. When you get home, you’re supposed to cut off the ends and put the flowers in water and then, à la peanut butter sandwich, the next morning you have a vase of sunshine. 3. A card arrived in the mail this week from an unexpected source, but was so kind and so appreciated. That cup of sunshine is just gorgeous!